Traditionally, casual clothing is more readily associated with the weekend than it is with a Monday. 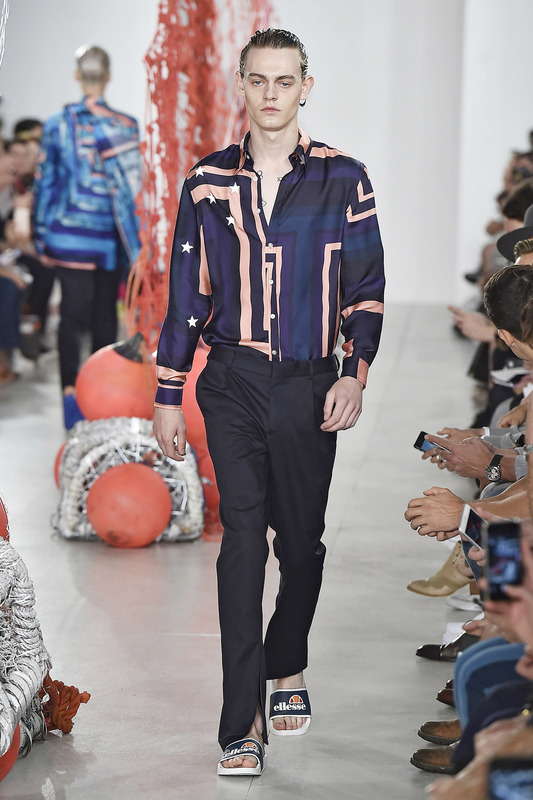 However, the final day of London Collections: Men Spring 2017 is a Monday and the flag our of the day is luxuriously casual. Streetwear and leisurewear prevail, sometimes sprinkled with touches of tailoring. Unfortunately, I have chosen to wear a suit, a tie, a dress hat and the least comfortable shoes I own. It is, as they say, a bad call. Gratefully seated, I embark upon my first show of the day, which is that of Katie Eary. The collection is made from plush cashmere, fine silks and it oozes luxury. Eary’s palate runs through the spectrum of colours that sit between blue and green, though silver is seen throughout. Her prints feature fish, laid out in lines as if over ice on the fishmonger’s stall. The inspiration for this collection is Eary’s upbringing in a working-class market-town, the luxuriousness of the fabrics representing the separation between politicians and the proletariat. Silk pyjamas, robes and slips give the collection a relaxed, leisurely ease. 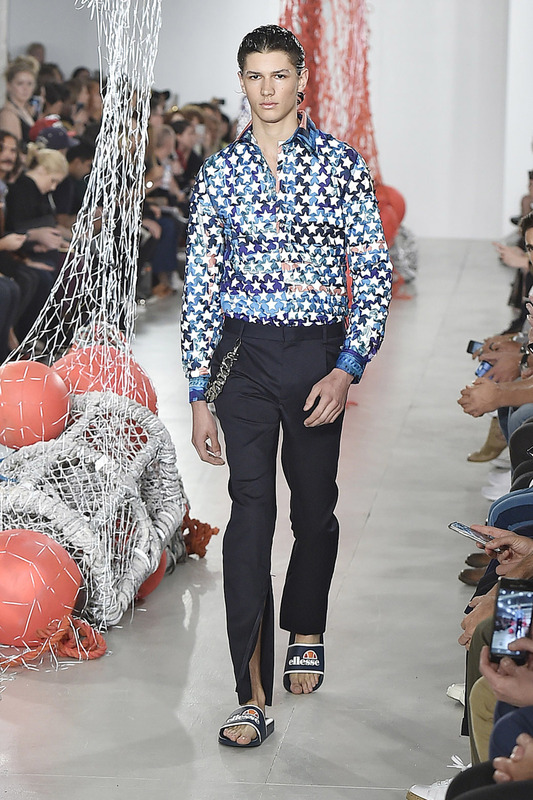 The underwater world is referenced throughout; mesh vests form nets and roughly painted patches in the models’ wet-look hair connotes blue and silver scales. Fish used here as a metaphor, reflecting the ‘deep blue foreboding of the sea’. 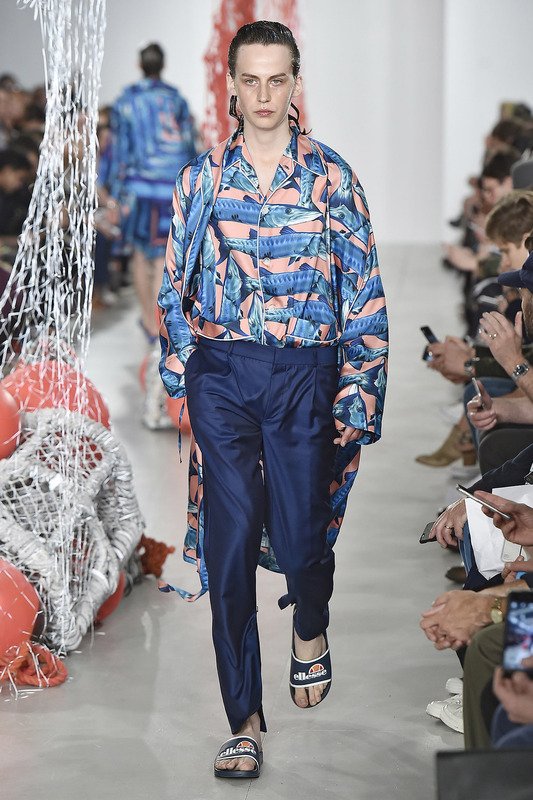 One notices the patterning of the fish for its market-stall-esque quality - the fish in Katie Eary’s SS17 collection are most definitely ‘out of water’. 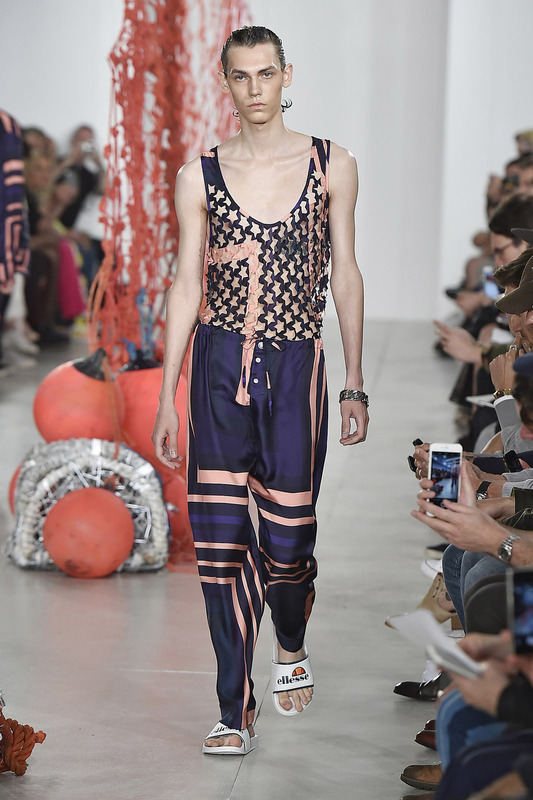 Like Katie Eary, Liam Hodges graduated from the Royal College of Art. Unlike Eary, Hodges shows a collection that looks remarkably practical. It feels inaccurate and perhaps somewhat elitist to describe ‘workwear’ as ‘casual’, seeing as its name clearly defines it as being for work. Having said this, it is by no means formal so it therefore fit easily into the mood of the day. Experimental construction is key; overalls, padded jackets and tracksuits alike are deconstructed and sewn back together to create a perfectly abstract collage. The proportions of Hodges silhouettes are all slightly ‘off’, cementing the collection firmly into the pavement of high fashion. The palate is distinctly SS17 - again we see black, white, beige and red. 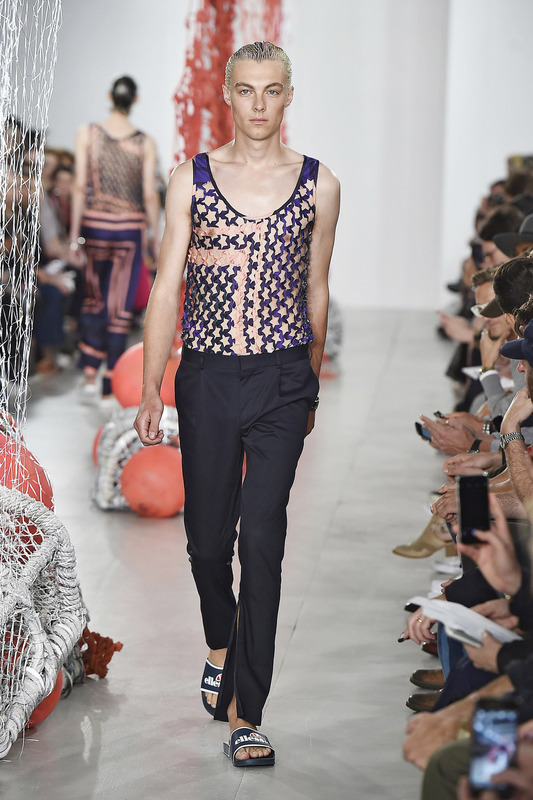 Late afternoon sees me strolling through a presentation by Tourne de Transmission. 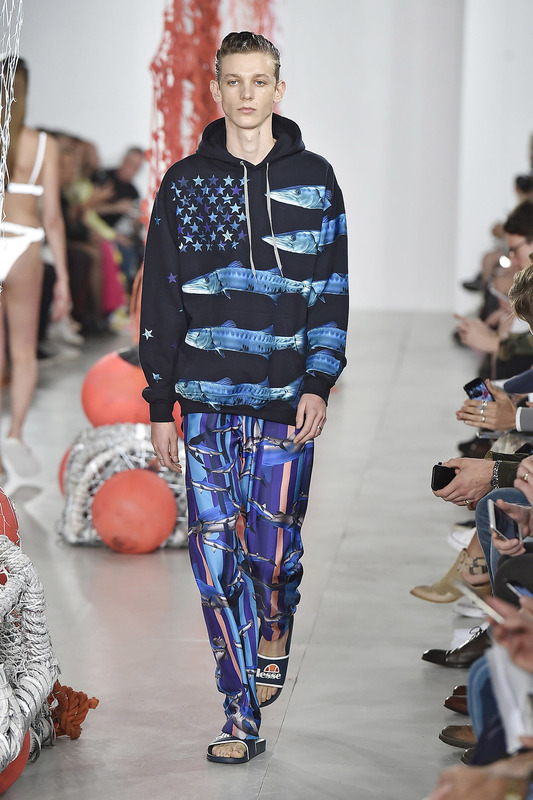 The collection, textbook streetwear, grew out of a conversation between the brand’s creative director and New York based artist Chris Dorland. From what I can see, the conversation in question can’t have been particularly interesting. Grotesquely elongated hoodies and patch-pocketed parkas are the only identifiable features of collection, while kimonos and plaid make references to Japanese culture and grunge that seem uninformed and unnecessary. Tailoring raises its head in the next collection, which comes from Korean designer Songzio and is inspired by his own artwork. Songzio’s wash of blue is immediately evocative of Katie Eary’s palate, but here the detail comes in coloured scratches that streak across the fabric. The aesthetic is like a thick layer of paint that has been scored into, revealing it’s predecessor. The effect is pleasant, the suits are well-cut, the mood is modern, but there’s little else I can say about Songzio SS17. As we draw to the close of LC:M, my feet punish me for the agony to which I have subjected them. I am reluctant to remove the shoes and enlighten myself as to exactly how many toes remain. 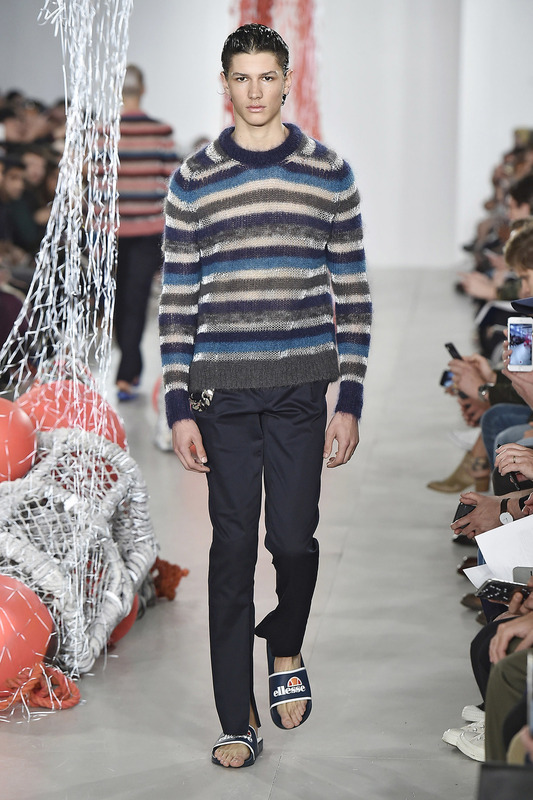 I hobble into a defunct London Underground station to view my final menswear show of the season. The concept of Blood Brother SS17 is the faded glory of the great British holiday. The garments include oversized trench coats for drizzly walks, padded waistcoats for fishing excursions and a suede bomber to fight bitter chills. 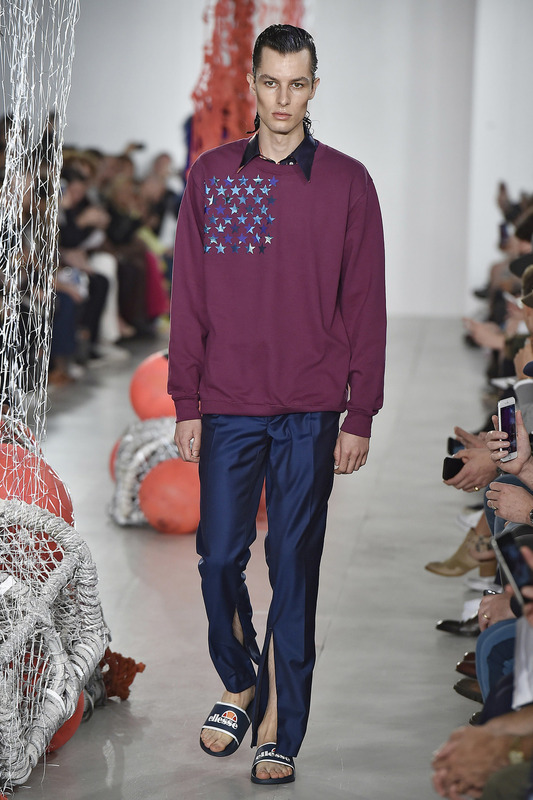 Blood Brother’s colour palate is on-trend, their trousers cut to kiss the ankle bone appealingly. The tailoring story, woven throughout the collection in pinstripe and check, stems from a character who finishes work, loosens their tie and heads to the park to catch twenty minutes of lukewarm sun. 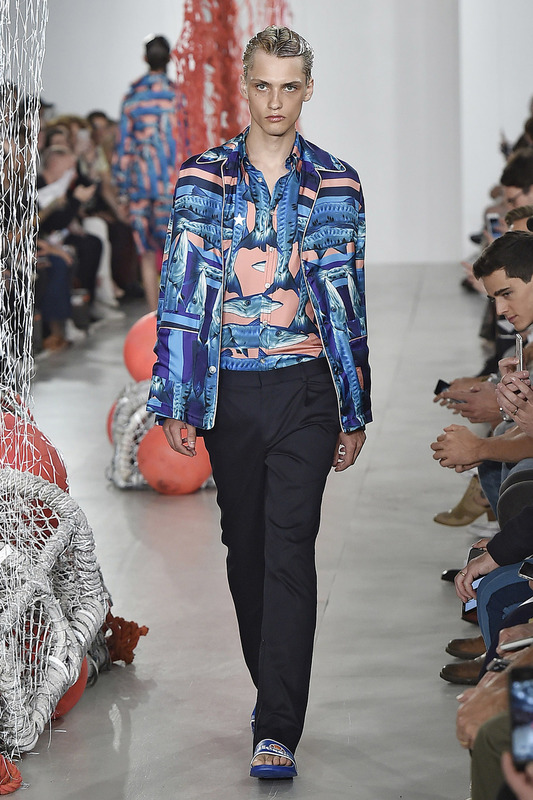 This character is somebody with whose intentions I can now identify, so I follow in their footsteps, wincing as I go, and leave London Collections: Men Spring/Sumer 2017 behind me.